The Aylmer Express newspaper serving Aylmer and Malahide area has given their website a new look and is now formatted for mobile devices. 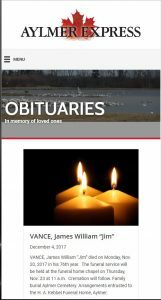 Obituaries are now included in the free online shortened addition. The full weekly paper issued on Wednesdays still requires a subscription. Posted on December 5, 2017 March 10, 2019 Author Bruce C. Johnson Jr.